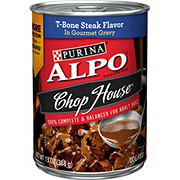 Cater to your dog's cravings for savory flavor with Purina ALPO Gravy Cravers With Beef in Gravy wet dog food. 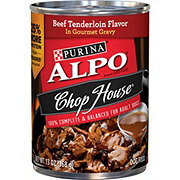 Tender slices of real beef give this recipe its bold taste, and each bite is smothered in rich gravy for added deliciousness. Let him delight in the tempting texture that invites him to nibble his way to the bottom of the bowl, and rest easy knowing he's getting 23 essential vitamins and nutrients in every serving, along with high-quality protein sources. 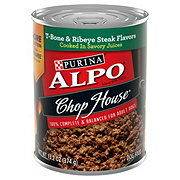 This recipe contains more protein than the leading canned competitor's adult dog food, and good-for-him ingredients give your best buddy the nourishment he needs to maintain his playful and adventurous lifestyle. 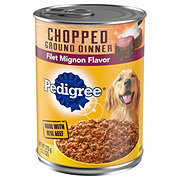 Daily Feeding Guidelines: Adult dogs need about one can per 11-13 pounds of body weight daily. Divide into two or more feedings. Feed up to twice this amount to puppies. Adjust to maintain ideal body condition. 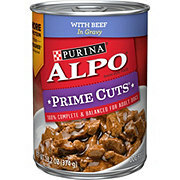 Alpo provides the extra nutrition needed by reproducing females in stages of gestation and lactation. Food consumption may vary during gestation, so feed the amount needed to maintain the pregnant female's good body condition. Food intake may double or even quadruple during lactation. When feeding with dry product: 1-1/2 cans replace approximately 1 cup of dry product. 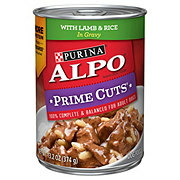 When changing to Alpo from another dog food, mix Alpo into his meal every day for a week, gradually increasing the amount until he is eating only Alpo. Do not freeze. Refrigerate unused portion. 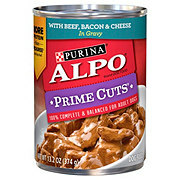 Feed Alpo for your canned, dry and treat needs. Ingredients Water Sufficient for Processing, Poultry, Liver, Wheat Gluten, Soy Flour, Beef, Meat By-Products, Corn Starch-Modified, Added Color, Tricalcium Phosphate, Potassium Chloride, Salt, Zinc Sulfate, Mono and Dicalcium Phosphate, Choline Chloride, Vitamin E Supplement, Ferrous Sulfate, Niacin, Copper Sulfate, Thiamine Mononitrate, Manganese Sulfate, Calcium Pantothenate, Pyridoxine Hydrochloride, Vitamin B-12 Supplement, Riboflavin Supplement, Vitamin A Supplement, Potassium Iodide, Folic Acid, Vitamin D-3 Supplement, Biotin, Sodium Selenite. Crude Protein: Min. (10.0%), Crude Fat: Min. (3.0%), Crude Fiber: Max. (1.5%), Moisture: Max. (82.0%).